Big, tough and astonishingly affordable, the Raptor Machete is 20" of raw, unbridled slashing power that won't cut a hole in your wallet. It boasts a razor sharp 14" clip point blade forged from resilient 3Cr13 stainless steel. Menacing ornamental serrations stud the blade spine, and a stately through-hole near the point adds a distinctive finishing touch to the monster blade. The handle is made of ultradurable pakkawood - stained a rich mahogany hue to highlight the elegant fine grain patterns beneath. The Raptor makes quick work of thick brush, tall grass and even branches and small trees. It's great for suburban backyards, remote back country and every setting in between. Thankfully, the included nylon belt sheath makes it easy to transport this colossal fixed blade in any terrain or locale. Why pay more, when the Raptor can hack it alongside machetes priced two and three times as high? 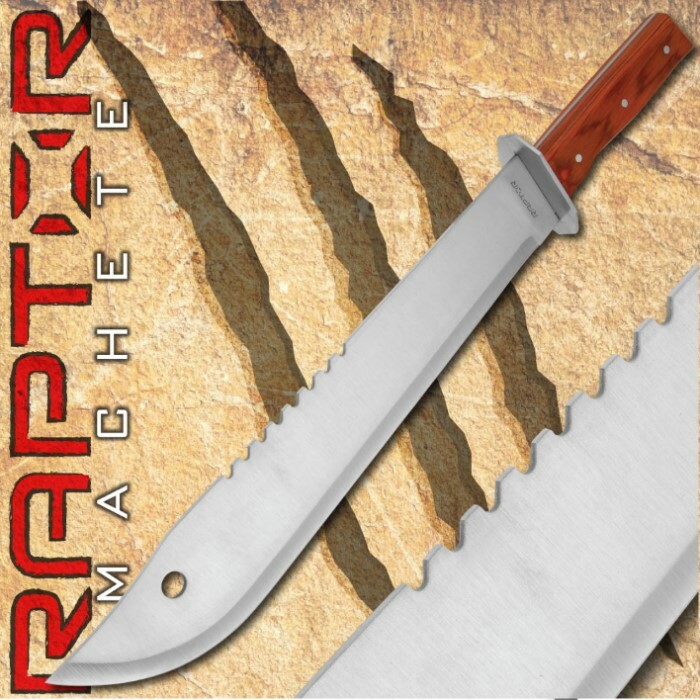 The Raptor Machete is a good slab of steel. 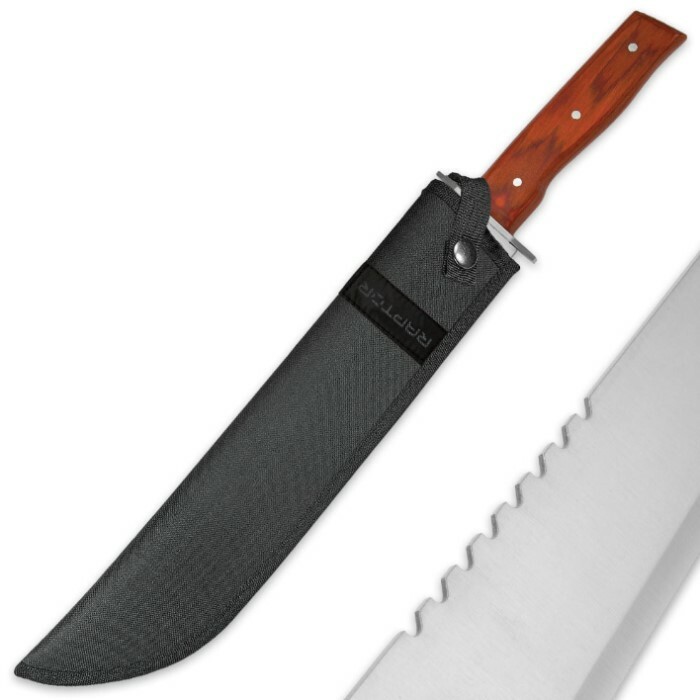 This machete is wicked looking,comes sharp,is priced right,and on top of that you get fast shipping! Could not pass up this machete for $10.00 and free shipping. Seems to be heavy duty and made well. Nice sheath to store it in also. I got this chopper in a shtf box and was surprised how hefty it was. 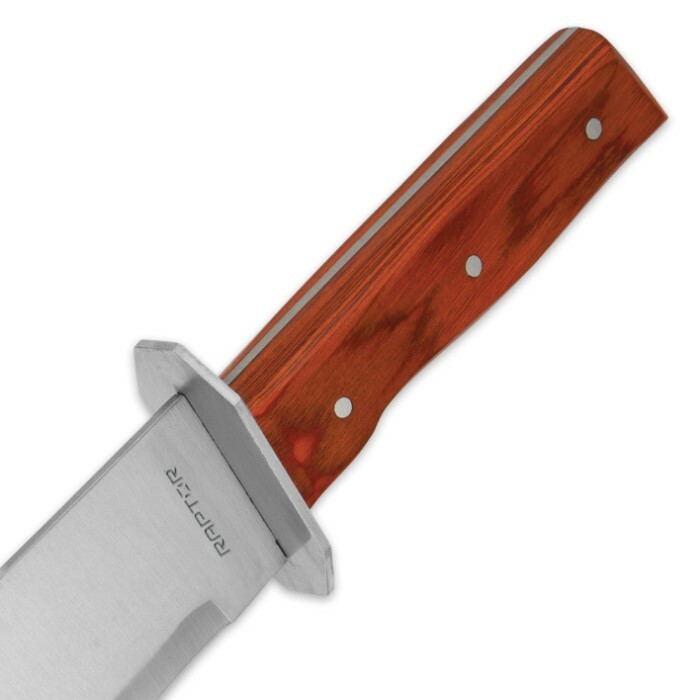 Full Tang and solid wood handle. You can reshape the handle to fit your hand if you want. Came sharp and easily touched up. Can't go wrong with this blade!! Blessings ?????? This was the first item I received as a member of the Knife of the Month club. I gotta say, for the price, this thing is great. A few minor issues, but nothing I can't remedy myself. The blade is rather dull, the handle scales and guard rattle, the scales are a bit rough, and I would have loved to see a bit of extra material at the end of the handle to keep it in my hand better. All that said though, once I sharpen it, if it holds up, it'd be well worth the price. I must admit, I was expecting something smaller from the KOTM, and was pleasantly surprised. This is 19 inches of AWESOME! Full tang. Straight. Seriously sharp. Get one while you can. Thanks BudK!